An invitation for a friends wedding, and a fun collaborative piece. Several frantic hours of brainstorming, followed by more frantic hours of making. The image on the left is the card as you pull it out of the envelope, with a piece of gold flecked rice paper printed with pine boughs partially obscuring the main image. 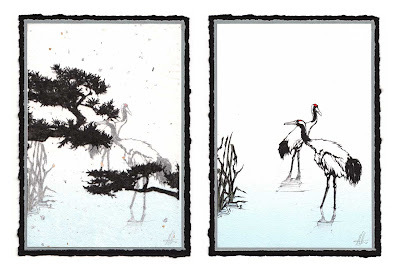 On the right, the image revealed as if you have pushed through the pines to discover two beautiful cranes.